As Modi reached out to Mark Zuckerberg, the man who revolutionized Social Media with Facebook, to help him promote his idea of Digital India, he was immediately confronted with a series of ‘controversies’, from Satya Nadella apparently wiping his hands after shaking his hands with Narendra Modi to the Digital India customized Facebook Profile Picture to promote the brand. After the colossal disappointment at branding Modi antinational in the Indian Flag controversy, the Internet latched on to these ridiculous notions to satisfy their urges for their daily dose of gossip and rumour mongering, cooked up by people driven cynical by too many Conspiracy Theories (ILLUMINATI!) or those on the Internet who are absolutely convinced their versions of events are exactly what actually transpired and others endorse their ideas simply because it gives them the opportunity to make fun of something they aren’t too fond of. Of course, there’s an alternate version of events which make perfect sense and obviously more reasonable and sensible because maybe, just maybe, that is exactly what happened? Remember this hilarious picture from our Facebook Page? When Facebook introduced the Tricolour Profile Picture to help promote Digital India, even before the idea could take root and go viral, some genius on the Internet noticed that the HTML code underneath had bits that contained the word ‘Internetorg.’ Internet Org as we know is a platform that would infringe the Neutrality of the Internet by forcing the consumer to pay more for certain services. Bingo! The Illuminati Syndrome kicked in and the conspiracy addled brain somehow managed to deduce that it obviously implied that changing your Facebook profile picture to the Tricolour means you give your consent to the Draconian Internet.org. Voila! Good job, Sherlock! Unfortunately, however, for our Sherlock, a Facebook spokesperson in his statement to Huffpost India made it clear there was connection between the two whatsoever. The spokesperson said, “There is absolutely no connection between updating your profile picture for digital India and Internet.org. An engineer mistakenly used the words “Internet.org profile picture” as a shorthand name he chose for part of the code. But this product in no way connects to or registers support for Internet.org. We are changing the code today to eliminate any confusion.” Sigh. A conspiracy theory goes bust again. It was good while it lasted. Not. And then there was the video that went viral which showed Satya Nadella wiping his hands after shaking hands with Narendra Modi. 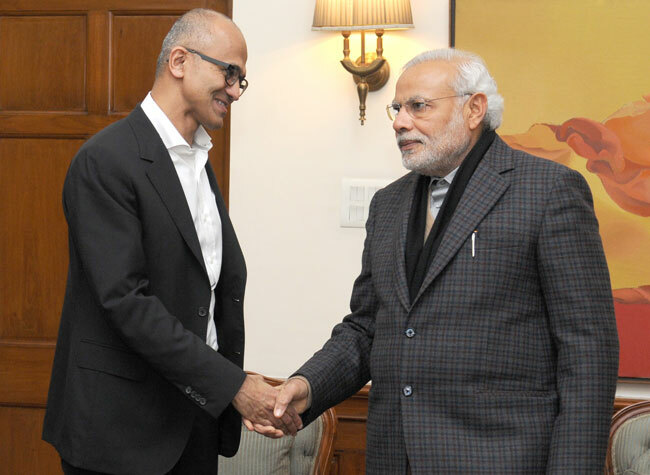 And as always, the Anti-Modi bloc was absolutely convinced that Satya Nadella did so because *obviously* he was uncomfortable with shaking hands with Modi. I mean.. Seriously? A man of Nadella’s stature would have compunction shaking hands with the Prime Minister of the largest democracy in the world? Well, that sounds, for the lack of a better word, delusional. Because obviously Mr. Nadella couldn’t have done it out of habit or sheer whim, right? Probably the video went viral simply because most people found something funny about it but the enthusiasm some people displayed while humiliating PM Modi on account or Mr. Nadella’s behaviour shows how desperate some people are to find some fault in every good thing he does. An unhealthy mind tries to drag everyone down to his level and then try to beat everyone on grounds they are most familiar with. But they should be aware, sensible people are smart enough to recognize their insidious motives and ignore their incessant rumour mongering. Another idea that went viral on the Internet was Modi apparently dragging Mark Zuckerberg for a photo. On a new uncut video that has been released, it is clearly obvious that Narendra Modi merely nudges Mark for a photo together. It is by no means anything extraordinary or worthy of notice in itself but made extraordinary by its association with Narendra Modi. All of us must have noticed some prominent politician nudging another delegate for a photo but because it was Modi, it had to gain negative attention. I can clearly hear SIR THIS SIDE! CAN YOU HEAR IT TOO? What’s distressing about the whole affair is that the Mainstream Media and journalists of prominent newspapers or channels often promote these baseless rumor mongering and gossip to help bring them into light. When the world is looking up to Narendra Modi to revolutionize India, some journalists find time to indulge in pointless stories instead of focusing on the good that Mr. Modi is trying to do. It is distressing that some prominent social media handles and pages instead of verifying the rumors such as the one about Internet.org help them gain prominence by highlighting them further. That the Mainstream Media appears to be extensively anti-Modi is no secret. And biased that they are, they latch on to any bit of rumor they can find to further their propaganda. ABP Live, zeenews, India times are only few that published headlines along the lines of “Satya Nadella insults Modi.” One simple question, why would he do that?! What does he stand to gain by it? And pardon me for saying, shouldn’t you be focusing more on the actual developments Modi is trying to bring in? But obviously, that doesn’t fit in your agenda, does it now? Well, the least that can be said is responsible journalism on the part of the MSM is a thing of the past now. Generation of Revenue has gained so much importance that it seems as long as promoting an agenda gets them what they want, they are more than willing to promote it. However, we live in an age of information. And in the age of information, the Mainstream Media has to either report accurate information or they will stand to lose all their credibility. If they haven’t already that is.